Jared Zehmer's studio in Seagrove, NC. So the name for this blog post is partially misleading. 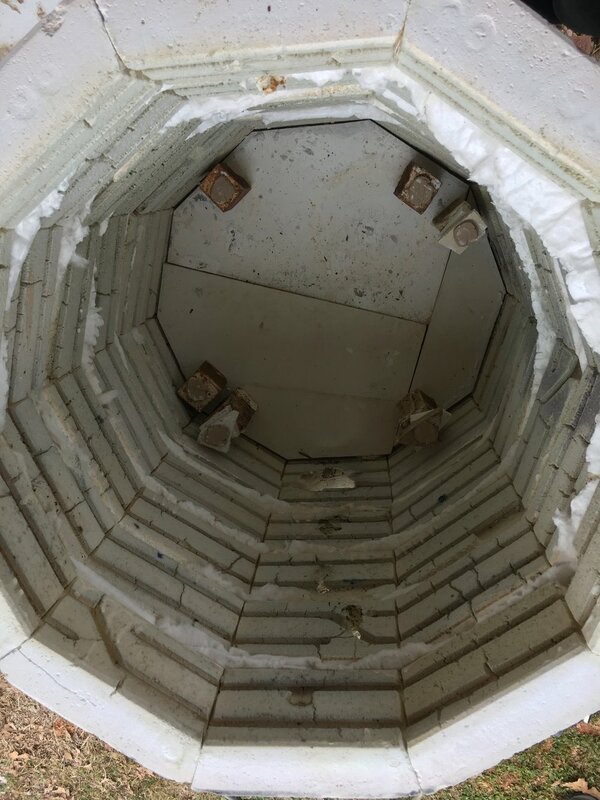 The nature of this converted electric kiln, constructed and fired by Jared Zehmer, is fairly simple and straight forward. With experimentation and a few tests, this transformed electric kiln yields some pretty amazing results! Jared has converted several old electric kilns into gas fired reduction kilns. One was of particular interest to me, his soda kiln. Over the years, he's collected and experimented with various electric kiln "shells" (basically just the body of the kiln--no actual electrical components, elements and all removed) and played around with various kit burner systems, sizes, and placements to mimic reduction firing but on a smaller more manageable scale. He's attempted this kind of firing with the introduction of soda once before and invited me and other soda enthusiasts; STARworks resident artists Katie Maloney and Christina Bendo to join him in firing his "electric soda". I've documented the process below. I'm pleased with the results of the firing and I hope to fire this kind of kiln again. I'm even considering making one for myself considering how quick of a turnover this firing process has! Thanks for the invitation to fire, Jarad! The body of the soda kiln. The kiln could be made larger or smaller depending on the number of rings that are stacked. The interior of the kiln is coated with a layer of celadon base glaze, like kiln wash, which acts a protective barrier for the soft brick. No pots are loaded at the very bottom of the kiln. Jarad uses 4" and 6" posts to create a sort of fire box at the bottom of the kiln. The pots are then stacked and staggered up the create the load. Jarad uses natural gas with a small single burner placed in front of the large opening drilled at the base of the kiln to fuel the kiln. Jarad and Katie loading the kiln. The shelves and pots are staggered to help create a flow for the flame and soda. To close the kiln and protect the soft brick, Jarad custom cut shelves that are placed between the top ring and the lid of the kiln. He puts in "chips", which are made of high alumina soft brick, around the opening at the top of the kiln. A layer of insulating kaowool is put between each of these layers and wherever else there may be a small opening. The firing took approximately 8 hours and had a few minor hiccups, but that's the nature of an experimental firing! Two pounds of soda was sprayed into the chamber via port holes and the burner port. Kiln Chistmasukkah was well received! It looked remarkably similar to the results of what you'd get from a more traditional soda firing, with just a little less reduction. This was my favorite little gem from the firing! Results from "electric soda" firing. February 2017. This gem glistened!